(MENAFN - Asia Times) A South Korean nuclear physicist harbors a secret admiration for North Korea's leader and hates the Japanese, who worked his father to death in a mine during World War II. He defects to the North, where he helps to build a Korean atomic bomb – which is tested on Tokyo. That is the plot of an ultra-nationalist, pan-Korea thriller by Kim Jin-myung. The Rose of Sharon Blooms Again – the Rose of Sharon is the Korean national flower – has sold three million copies since its publication in 1993, making it one of South Korea's biggest selling novels ever. Subsequently made into a film, the story was a fantasy for ultra-nationalists on both sides of the Korea Strait. The drama revived memories of a similar incident in the East China Sea in 2013 when a Chinese frigate locked its radar onto a Japanese destroyer and a helicopter. There were fears that the incident could have precipitated a shooting war. An accidental conflict arising out of an incident such as the lock-on controversy is conceivable, but 'would have to be a helluva screw-up,' said Brad Glosserman, a visiting professor at Tama University in Tokyo. Could relations worsen further? Let us consider some scenarios. South Korea issues a new defense white paper, which, for the first time mentions Japan as a security threat, while dropping that designation for North Korea. Tokyo vehemently protests. Seoul rebuffs the protest and says that Prime Minister Shinzo Abe is unreliable compared with Kim Jong Un. Tokyo withdraws its ambassador. In October, Tokyo withdrew from an international fleet review hosted by South Korea after Seoul demanded that its ship not display 'wartime' flags, even though the rising sun design has been Japan's naval ensign since 1889. In November, Seoul unilaterally dissolved the Japan-funded Reconciliation and Healing Foundation, designed to provide Tokyo's compensation to surviving "comfort women". The foundation was the centerpiece of a 2015 bilateral deal that was supposed to lay the emotive wartime issue permanently to rest on a government-to-government level. Yet another row arose when the Supreme Court of South Korea ruled that families of Koreans forced to work in Japanese factories or coal mines during the war had rights to compensation from companies that employed them as unpaid labor. Japan's position is that the 1965 agreement that normalized relations between the two countries specifically ordained that all issues of compensation or war reparations had been settled for all time. That position was rejected by the court. Japanese right-wing nationalists sneak into Korea and blow up bronze statues of ‘comfort women' in front of the consulates in Seoul and Busan that are meant to shame Japanese. Tens of thousands march to condemn Japan, while a mysterious fire breaks out in the Yasukuni Shrine. Tokyo says the incidents are connected. The next step for the plaintiffs will be to seize assets from Nippon Steel & Sumitomo Metal Corp. in South Korea. If that goes ahead, Tokyo may retaliate by seizing Korean assets in Japan or possibly levying tariff hikes on imports from South Korea. Economic retaliation could spiral out of control. For the moment, Japan has said it will invoke a third-party arbitration clause in the 1965 agreement. If that happens, it will be the first time such talks concerning the 1965 agreement have ever convened. Meanwhile, a territorial dispute – competing claims for the Dokdo (Korean) or Takeshima (Japanese) Islets between the two countries – continue to roil relations. Right-wing elements in the National Assembly revive the long-dormant Korean claim to Tsushima, a large island in the Korea Strait, known in Korean as Daemado. In 1948, the government of the then-newly created South Korea claimed the island. American occupiers brushed the claim aside. Tokyo reinforces a 350-man army garrison there and orders a halt to all Korean land purchases. Tokyo claims the Dokdo/Takeshima islets but does not patrol the waters or engage in related operations. From time to time, Korean VIPs, including even the president, are flown out to the Dokdo. Tokyo usually issues a protest, but the Japanese ambassador has on occasion been recalled. Korea is prepared to repel any attack. The islets, unlike the Senkaku/Diaoyu Islands (the subject of a dispute between Beijing and Tokyo), are garrisoned by an armed police detachment, which would discourage any kind of commando operation or incursion by nationalists. Seoul recently completed a new 'forward deployed' naval base on the island of Ulleungdo – the closest Korean territory to the islets, which is large enough to accommodate guided missile destroyers and even Korea's 15,000-ton amphibious assault ship, named – you guessed it – Dokdo. Vessels based at Ulleungdo can reach Dokdo in two hours. Since 1986 the South Korean navy has staged exercises in waters around Dokdo to practice defending the islets from invasion. From whom, Seoul does not say. The annual Liberation Day parade in South Korea on March 1 turns into a riot as hyper-nationalists try to burn down Japanese enterprises. The president orders the Japanese out of the country 'for their own safety.' Tokyo cuts diplomatic relations. 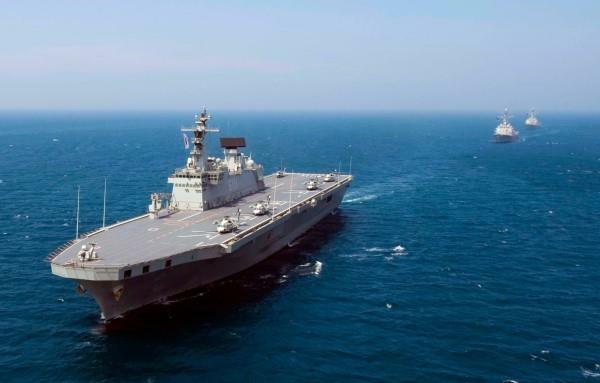 For two decades South Korea has been expanding and modernizing its navy well beyond the needs for coastal defense with the goal of creating a blue-water force that can roam the high seas. Unlike China's navy, Tokyo has yet to look on this buildup as a threat. 'But present in the background of most South Korean military development is a desire to keep up with the Japanese and, ideally, someday teach [Japan] a lesson as payback for past sins,' says Grant Newsham, a retired Marine Corps officer and a senior research fellow at the Japan Forum for Strategic Studies. Still, cool heads do not believe that relations could descend to the low of an actual exchange of fire. 'The simple reason that the two countries will not go to war is that both sides rely on the US military presence,' Koichi Nakano, a professor of political science at Sophia University in Tokyo, said. He was referring to the separate alliances that Seoul and Tokyo have with Washington.